Super Savings Item! 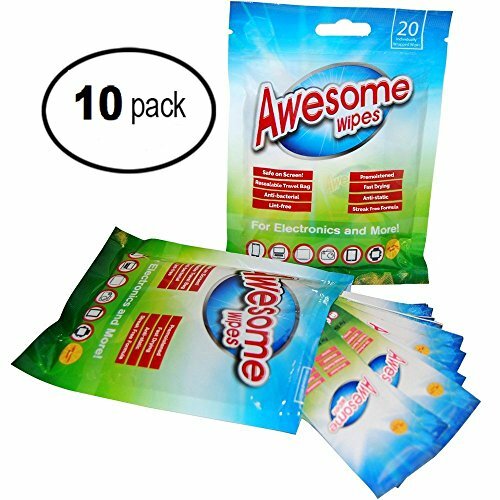 Save 37% on the Awesome Wipes Electronic Wipes for Computers - Disinfecting Cleaning Wipes for All Types of Screens and Lenses - Resealable Pouch is Great for Travel (10 Pack) by Awesome Wipes at Home Entertainment Centers Online. MPN: 4332716749. Hurry! Limited time offer. Offer valid only while supplies last. Kill those germs before you get sickDid you know that a public toilet seat can actually carry fewer germs than your smartphone or tablet? Did you know that a public toilet seat can actually carry fewer germs than your smartphone or tablet? Fortunately, Awesome Wipes has the perfect solution for you: pre-moistened anti-bacterial, disinfectant wipes. Whether it's a smartphone, tablet, computer, laptop, keyboard, monitor, smart watch, TV, CD, DVD, camera lens, musical instrument, or even a pair of glasses or sunglasses, our non-abrasive wipes will leave it clean, shiny, and safe. They're also lint-free and anti-static, and are specially formulated to dry fast without leaving unsightly streaks, and you'll love their light lemony-fresh scent. Each of the 20 wipes is individually wrapped to ensure they won't dry out, no matter how long you wait to use them. We're so confident of this that we offer a 100% Lifetime Guarantee! The handy eco-friendly resealable travel bag means you can take these with you wherever you go, in your pocket, backpack, purse, briefcase, camera bag, or car, whether you're travelling with work, on vacation, or simply on a weekend hiking trip. Useful at home, at the office, by parents, photographers, travelers - in fact we can't think of anyone in this age of electronics who wouldn't benefit from the peace of mind that comes from always having disinfectant wipes on hand. Get Your Awesome Wipes Screen Cleaning Wipes Today And Never Worry Again About Getting Sick From Your Smartphone. Click Add To Cart Now! GERMS? NOT ANYMORE! - Antibacterial disposable wipes are here to protect your devices from collecting dust and germs. And don't worry about the quality of your screen devices afterwards, these wipes are streak-free! And even better, the innovative pouch is resealable so you can use them as much as you want without losing their pre-moistened disifectant. SUITABLE FOR ALL ELECTRONIC DEVICES, AND MORE - Our wipes work great on all electronics, including smartphones, tablets, computers, laptop keyboards and monitors, TVs, smart watches, LCD and LED screens, and games equipment, as well as CDs, DVDs, phones, camera lenses, musical instruments, GPS devices, glasses, sunglasses, and more. NO STREAKS - Awesome Wipes are specially formulated to make your electronics shine without streaking. They're also lint-free, anti-static, fast-drying, and non-abrasive so they won't scratch your screens. TAKE THEM ANYWHERE - The resealable travel pouch means you can put these in your purse, briefcase, backpack, car, desk, camera bag, or just about anywhere. They're great for home use of course, but you can take them on vacation, business trips, or camping and hiking expeditions, for example. WON'T DRY OUT, GUARANTEED - Each eco-friendly easy-to-open pack contains 20 individually wrapped wipes so they will never dry out. If they ever do, just send them back and we'll refund your money immediately. If you have any questions about this product by Awesome Wipes, contact us by completing and submitting the form below. If you are looking for a specif part number, please include it with your message.